If you don't actually believe that smoking exists in movies marketed directly at children, consider this question: which of the following Disney characters did NOT smoke in a G-Rated film? As you think about this, remember that these are all major characters in their films, and none of these characters is a villain. The answer will be revealed later. From 1950 to 1990, the appearance of smoking in movies decreased; starting in 1990, there was a rapid increase, such that by 2002 smoking in the movies was as common as it had been in 1950! Beginning in 2002, the total amount of smoking depicted in movies was greater in youth-rated (G/PG/PG13) movies than in adult R-Rated films, increasing adolescent exposure to movie smoking. Most of this occurred because the MPAA began to "down-rate" the movies by the mid-1990s, issuing PG13 ratings to films that would have been given R ratings in the past. Why? Because teenagers spend more money on movie tickets, making R-rated movies a financial liability for the film industry. Between 1950 and 2000, the prevalence of adult smoking in the United States fell from 44% to 22%; yet lead actors smoked in 60% of popular films during 2002-2003. In other words, smoking is much more common in the fictional world of films than it has ever been in the real world. Smoking by female leads nearly tripled from 11% in the 1960s to 30% by 1997. There was at least one smoking character depicted in all seven animated films released during 1996-1997. In the fictional world of the movies, smoking is rarely depicted as a chronic, relapsing addiction that causes preventable disease and death. And here's the kicker: in a survey of adolescents who smoke, 52% cite the depiction of tobacco use in the movies as the primary reason that they tried their first cigarette! 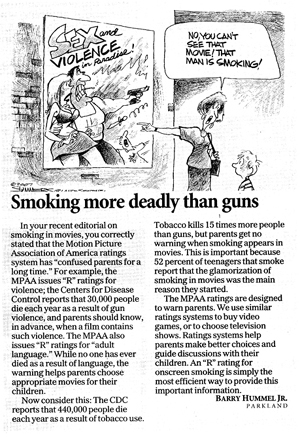 Adapting the existing MPAA ratings system to include tobacco use as a reason for an automatic R-rating. This would force the motion picture industry to remove the depitction of tobacco use from all films marketed to children. Require that anti-smoking public service announcements (PSAs) be shown in the theaters prior to any film or movie trailer depicting tobacco use. Require that anti-smoking PSAs be shown before any televised advertisment for a film that includes smoking at the expense of the film's ditributor. Create a parallel ratings system that rates films solely on tobacco use, which will give interested parents guidance regarding the films and distributors who have the best interest of our youth at heart. The Quit Doc Research and Education Foundation has developed SmokeScreeners, an outreach program designed to educate youth, parents, and schools on this important topic. Part of this program will be to encourage families, including students, to rate films based on their smoking content. This will create an enormous ratings database that can be shared, allowing interested parents and schools to pick and choose what films and DVDs their children view, or at least discuss the depiction of tobacco in realistic terms. Let's review: these are protagonists in G-Rated movies produced by a studio whose name is synonymous with wholesome family entertainment. As parents, we cannot ignore the problem, because that promotes the false sense in our children that smoking is a normal behavior, not a chronic drug addiction. We need to work towards cleaning up the films that are marketed to children; short of that, we need to discuss the issue openly and honestly with young people so that they understand how they are being targeted and manipulated by the tobacco industry. Click here to watch "Walt's Ashes", a short film by Dr. Barry Hummel highlighting the long history of smoking in Disney animated feature films. Click here to read an article written by Dr. Hummel for Flip Animation, an animation industry e-zine. For more information, visit SmokeScreeners, Smoke Free Movies, Scene Smoking, and Celebrity Smoking.